The Samsung Galaxy Note 9’s August 9 launch date is almost upon us now. In fact, it’s so close that shops seemingly already have stock of the handset, and one of the boxes has just been photographed in Russia. While the image - which was shared by SamMobile - doesn’t include the Note 9 itself, it does feature a full specs list, revealing just about everything about the phone. Highlights include a 6.4-inch QHD+ Super AMOLED screen and a 12MP dual-lens rear camera, with one lens sporting an f/2.4 aperture and the other being able to switch between f/1.5 and f/2.4, just like the camera setup on the Samsung Galaxy S9 Plus. 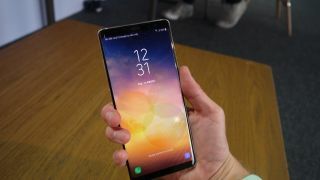 The Samsung Galaxy Note 9 is also listed as having an 8MP front-facing camera, an S Pen that can be used as a remote control, as has been rumored before, a 4,000mAh battery and 128GB of storage (though another recent leak suggests you’ll be able to get the phone with up to 512GB). The Note 9 box also lists stereo speakers, wireless charging, Samsung Pay, an iris scanner, and IP68 certification, meaning the phone would be dust-proof and water-resistant to depths of 1.5 meters for up to 30 minutes. Of course, as with any leak we’d take this with a pinch of salt, even this close to launch, but the listed specs all line up with things we’ve heard before and paint the picture of a bigger, likely longer-lasting phone than the S9 range, with a few new features but a lot of similarities. We’ll know for sure soon.